Pakistan’s new age skipper was born on 22nd May 1987 in Karachi, Sindh. His father Shakeel Ahmed Siddiquie is the owner of Shakeel Brothers Publishing hose which is one of the most popular publishing companies in Pakistan. At age of 10 Sarfraz memorized whole Quran, the holy book of Islam. Sarfraz completed his bachelors of Engineering in Electronics in Karachi. He studied in the Dawood University of Engineering and Technology and was a bright student. Sarfraz became captain of the Under 19 team and led them at the ICC Under 19 Cricket World Cup 2006 in Colombo. He was one of the best wicket-keeper in Under 19s as from 15 matches Sarfraz caught 23 catches and stumped 6 times. He also had a brilliant batting average of 39.75. In the Under-19 World Cup when his side squared off their arch rivals India, they were totaled at 109. 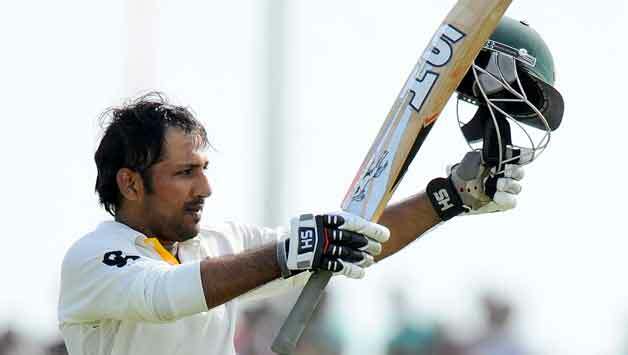 However, Sarfraz showed spectacular leadership and wicket-keeping skills, ultimately steering India at 9 for 6. The India Under 19 were all dismissed at 71 and the Pakistan side eventually grabbed the coveted trophy. Sarfraz outstanding performances in the Under 19 steered him into the domestic league. He played for Karachi and Sindh in his debut season. During the tour of India in 2007, Sarfraz was named as reserve wicket keeper for Kamran Akmal. He was able to debut in the One Day Internationals in the fifth match but didn’t got a chance to show his batting skills. Sarfraz continued impressing selectors at the domestic season as he bagged three fifties and dismissed 21 batsmen from his gloves in the opening five matches. As a result, eh was picked ahead of Kamran Akmal at the Asia Cup 2008. With Kamran Akmal’s poor performances in the first two Test matches in their tour to Australia in 2010, Sarfraz got selected in the starting XI at Hobart. Sarfraz achieved the accolade of fastest Pakistani wicket-keeper to post 1000 runs after he jolted down a superb 96 off 85 balls against Sri Lanka at Galle in 2015. As a result he not only became the seventh Pakistani wicket-keeper to reach the 1000 mark but also became the joint fastest to 1000 wicket keeper with Imtiaz Ahmed after achieving the feat in his 28th inning. The 29 year old cracked a century from just 80 balls in the longest format of the game against Australia in United Arab Emirates. The match was eventually clinched by Pakistan with 221 runs. Sarfraz has bowled just four deliveries in his first-class career and gave away only five runs. This was the only over he bowled in all format and levels of the game. The new age skipper has the ODI record for most dismissals in an innings. He made the record when Pakistan square off South Africa in the ICC Cricket World Cup 2015. Sarfraz smashed 49 runs from 49 balls and took six catches, eventually equalling the record for most dismissals in the One Day Internationals. He was also named Man of the Match. In the following match against Ireland in the world Cup, Sarfraz cracked his maiden ton in this format. His unbeaten knock of 101 led him bag his second straight Man of the Match award. By the summer of 2015, Sarfraz got married with Syeda Khushbakht Shah. The star was named as the vice-captain of the team after Misbah UlHaq stepped down after the World Cup 2015. He was rumoured to be the next captain but Azhar Ali was appointed the captain by the selectors. However, Sarfraz was named captain for a single match when Azhar Ali was ruled out due to injury in the third ODI of Pakistan tour to Zimbabwe. He led Pakistan to glory by seven wickets in the match. Sarfrazhas been part of Karachi Dolphins, Karachi Harbour, Pakistan A, Pakistan International Airlines, Pakistan Under 19s, Sindh and Quetta Gladiators. He led Quetta Gladiators into the final showdown of the inaugural Pakistan Super League but bowed out to Islamabad United in the finals. After Pakistan saw an early exit at World T20 2016, Sarfraz Ahmed was named as the new captain after Shahid Afridi stepped down.